We have been talking about various and innovative ways to boost website traffic and bring in more readers into your site. Apart from the obvious SEO tools and techniques, recently we posted a few articles about adding some useful widgets and buttons into your website that can play an important role in bringing unique readers. Today lets look into Facebook Activity Feed, another of such plugin that you can add to your blogger and increase the incoming traffic. It is quite inevitable that, if utilized positively with the right kind of knowledge, social media such as Facebook can be a break through in increasing your website's page views. Although we have talked about the effective use of social media with respect to site traffic, another of such traffic amplifier is the Facebook Activity Feed plugin. This plugin displays posts and also recommends new stories which are liked by your visitor's friends building a social engagement. Readers are attracted more into your site to look into what their friends are following or liking these days. 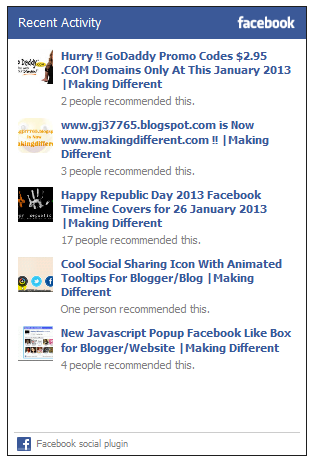 In addition it also displays your blog posts which have been liked on Facebook by different users. How To Add This To Blogger? Here are a few simple steps to add Facebook Activity Feed Plugin to your blogger. In case you have added Facebook recommendations bar in your blogger, you can skip step No.3 and directly move onto the step that follows it. Step # 3: Find the <body> tag in your HTML editor. You can use the Ctrl + F functionality to directly go to the tag, and paste the following code inside the body tag. Step # 5: Paste the following code in the content box and give it a title. Step # 6: Make the following changes to the above code. Replace the url with the one of your own blog. In case you want to display just the recommended post and hide the people who recommended it by liking the post, just switch the data-recommendations from true to false. Save you widget and you are ready with the plugin. This plugin has the power to enhance your website pageviews and blog traffic. I hope you enjoy a greater level of blog engagement with users across Facebook.